HVAC companies come in all varieties, and frankly, we don’t often think about them during our mild winters, when the weather is very temperate and we run our systems less often than we do in the summer. Nonetheless, problems still crop up in our heating and air conditioning system from time to time, and when they do, you need a quality service to effect repairs. This is no less true for your heating system in the winter than it is for your air conditioning system in the summer. There’s no shortage of HVAC services in the area, and most of them can do at least a halfway decent job of addressing your issue. But you need services that don’t just do an adequate job: you need a service that will fix the problem the right way for an affordable price, and which you won’t have to keep calling for the same problem a few weeks or months down the line. An emergency call for your heating and air conditioning system is less likely during this time of year, when most homes can just sit tight when their heater goes down and wait until regular business hours. But in the summer, when temperatures soar well above triple digits on a daily basis, a breakdown in your HVAC system can be catastrophic. You need a service that understands how important a functioning system is, and will respond 24 hours a day, 7 days a week when you need repair or replacement services. Customer reviews are decent indicators of the quality of service a given HVAC repair company can offer, and good word of mouth is an excellent way to establish a strong reputation. But high-end companies also gain the endorsement of the companies whose systems they work on. 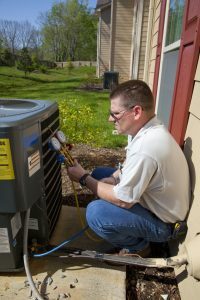 HVAC corporations like Lennox, Mitsubishi and Rheem depend on local services to fix their systems when trouble arises, which means that those services are responsible for maintaining their good name. Look for a service that offers the endorsement of such companies. It’s a sign you’re in good hands. No matter what kind of system you own, you need the technician to treat your specific problem. Not apply a one-size-fits-all technique and hope for the best. One good way to determine this is to look for a variety of services and systems the company works on. That can include alternative forms of heating and air conditioning such as heat pumps and ductless systems, as well as ancillary products like indoor air quality devices. That means a depth of experience and skill that can be brought to your unique issue. For HVAC services throughout Torrance, CA, call on Greenleaf Heating & Cooling today!